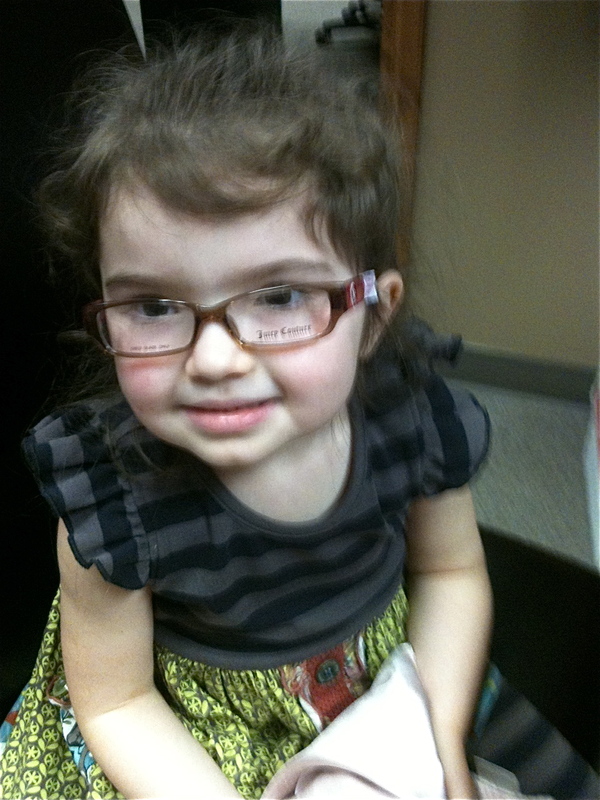 Molly Kate tries on glasses. Granddaughter Molly Kate turned four Feb. 20 and about a week later she was fitted for glasses. Arriving soon will be her new pink and brown frames with their lenses crafted to deal with nearsightedness and astigmatism. Both her mom Katie and I began wearing glasses in childhood, son Jeremy, Molly Kate’s dad, well past childhood. There is the possibility Molly Kate’s myopia could be genetic. I am so thankful her nearsightedness has been recognized and addressed early. Yes, she is lucky it was recognized early. What a little QT. Perhaps she will be even cuter in glasses...s it possible that she could even be any cuter? Are these the frames they chose? I have the same problem and they didn't discover mine till I was 9. Good for her. Its amazing how much different life will be for her. She's a real cutie. She may have the myopia gene but I know she has your sweet and gentle spirit gene. You can just tell from the picture. She is adorable in them and it really is a blessing it was discovered before she started doing badly in school because she could see as well as she should. Thank you so much for your caring comment. You are right. There are so many things I think I will tell Joan then realize those days are over. Now isn't MK something with her glasses?! Can't wait to see her pink and brown ones. Thanks for leaving so many nice comments on my blog posts. I've left a few for you, as well, as I've gone back and caught up with what I missed!